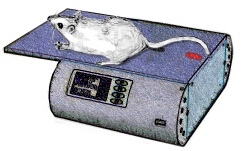 This test measures pain sensitivity as indicated by a "tail flick" response to heating a small area of the tail of a rat or mouse. The animal's tail is placed over a window on the platform and a foot switch activates an intense light beam that heats the tail at a reliable, reproducible rate. When the animal senses a sufficient level of discomfort, it flicks its tail, automatically stopping the timer. The reaction time from activation of the light beam to the tail flick is automatically presented on a digital display (timer resolution, 0.1 seconds). The time for the animal to move (flick) its tail away from the heat is recorded as a measure of spinal nociception.